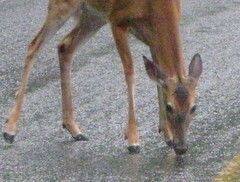 Here is a shot I took recently of a deer lapping up water off the road during a rainstorm. It was so thirsty that it allowed us to keep pulling up closer and closer. It only ran away when a car came quickly from the other direction.